The benefits of belonging to a CSA: deliciously fresh local produce, the fun of figuring out what to cook with what you’ve got, trying new recipes and making some up on your own. The con: deciding how best to cook and eat vegetables you’re not entirely crazy about, or just plain have never heard of. Which brings me to turnips and garlic scapes! I have never been a big fan of turnips, and just learned about garlic scapes from our CSA last year, and this week we received two bunches of small Hakurei turnips with beautiful greens, and those scapes, which taste a little bit like a cross between garlic and green onions, only milder. Tonight’s pasta is what I came up with, and I must say, it was pretty tasty! The beets are an adaptation from the original recipe in Deborah Madison’s Vegetarian Cooking for Everyone: roast 1 1/2 – 2 pounds of beets, with a splash of water in a brownie pan covered with foil, at 350 for 40 – 50 minutes, until you can pierce one easily with a knife. Let cool, then rub off skins and slice each beet into 8 pieces. In a bowl, whisk together the zest of one lemon, juice of 1/2 lemon, 2 TBS extra-virgin olive oil, 2 TBS chopped parsley, 2 TBS chopped cilantro, 1 tsp dried mint (or 1 TBS fresh), 1/2 tsp ground coriander, salt and pepper to taste. Add beets and toss well to coat. This dinner serves 4. 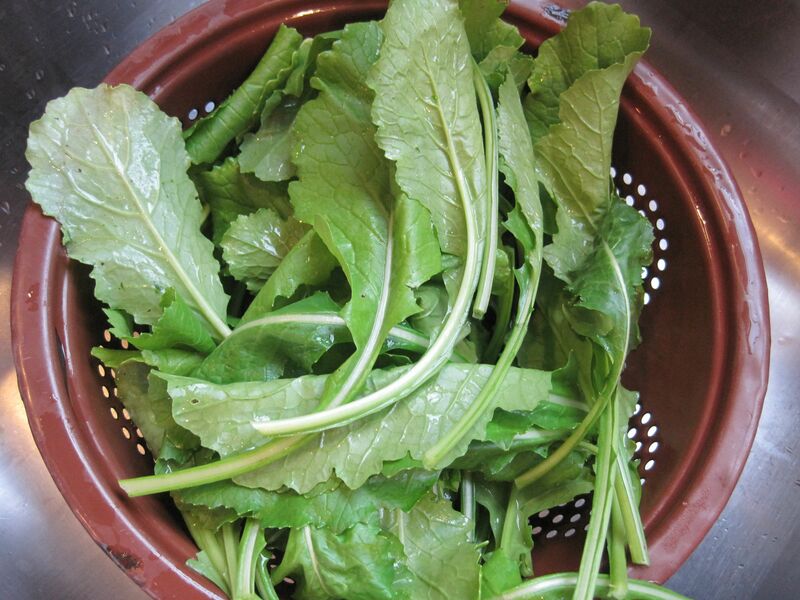 Slice off turnip greens and wash, leaving them whole if small to medium-size, or sliced in half crosswise if large. 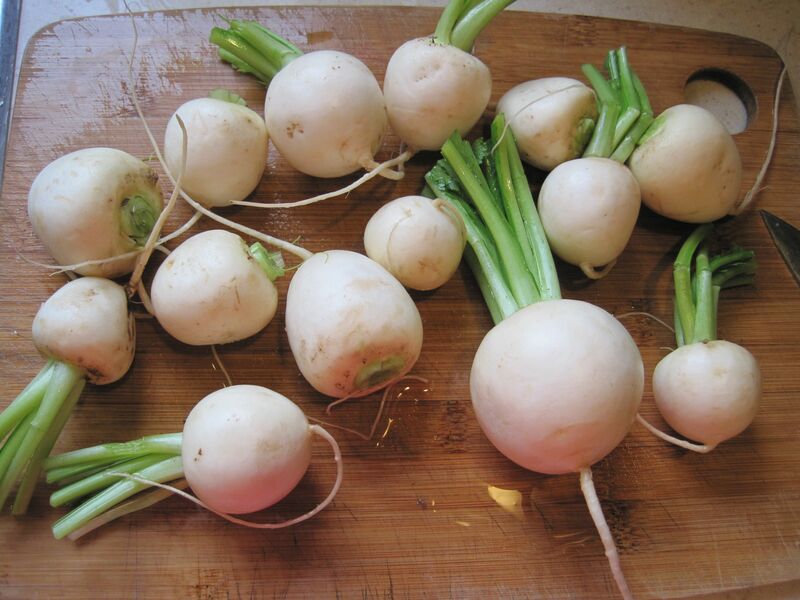 Trim turnips and cut into quarters or sixths, depending on size. If the turnips are small you do not need to peel them. Bring a large pot of salted water to a boil. 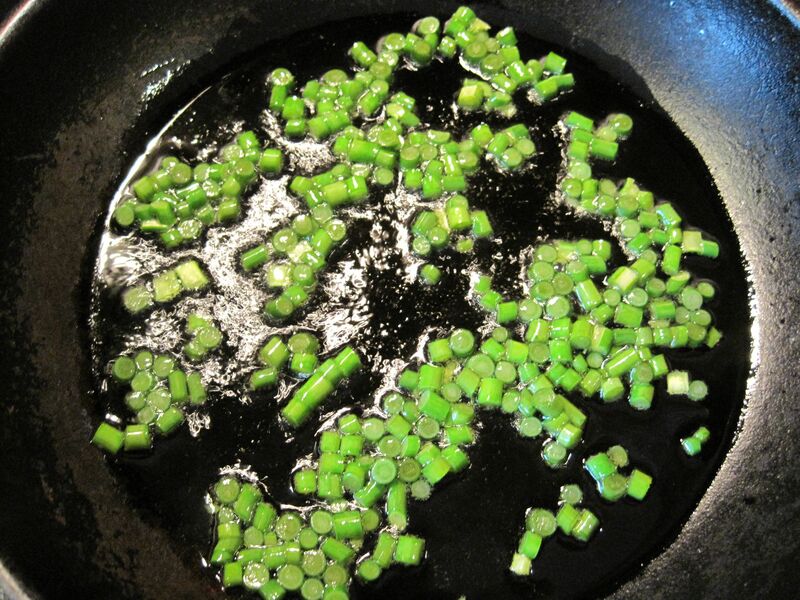 Heat the oil in an oven-proof skillet over medium heat; add garlic scapes and cook, stirring, for 1 minute. 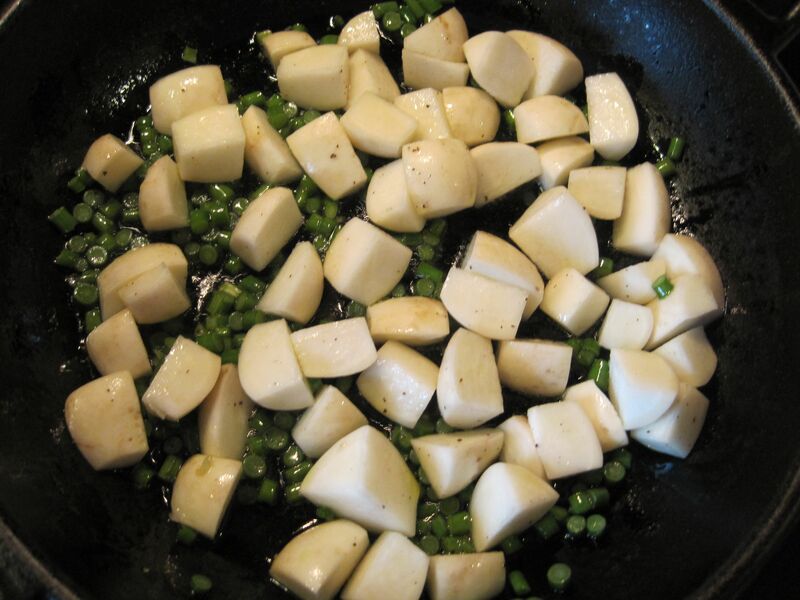 Add turnips, salt and pepper, and toss to coat turnips in oil. 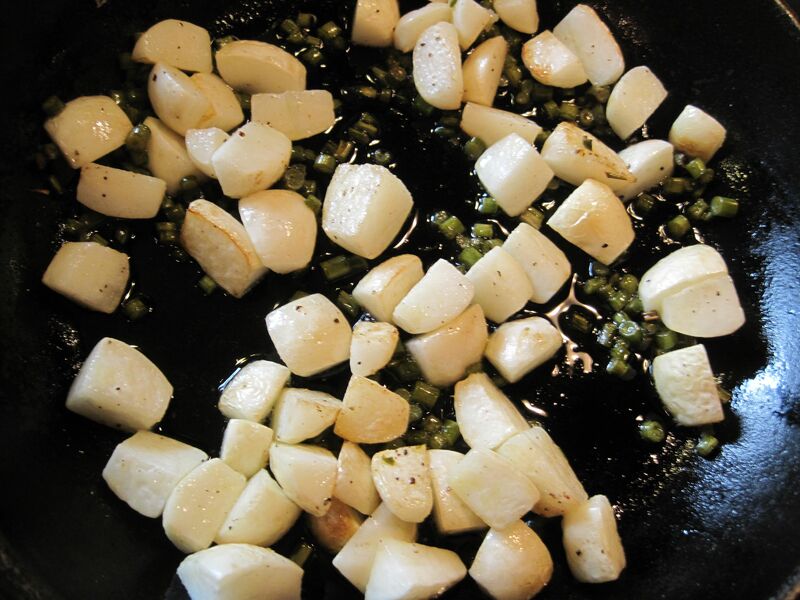 Transfer skillet to oven and roast turnips for 15 minutes, or until tender and slightly golden, stirring once. 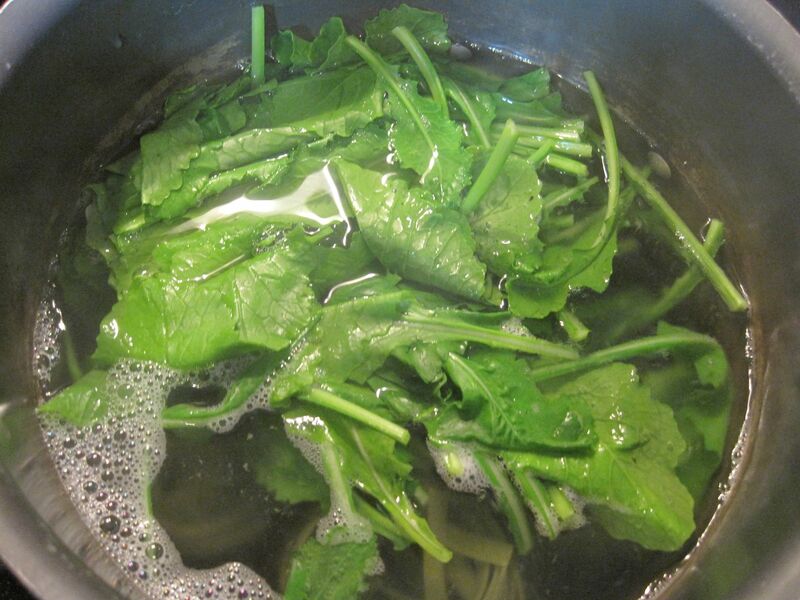 Meanwhile, cook pasta and turnip greens together, according to pasta package instructions, reserving 1/4 cup cooking water before draining. 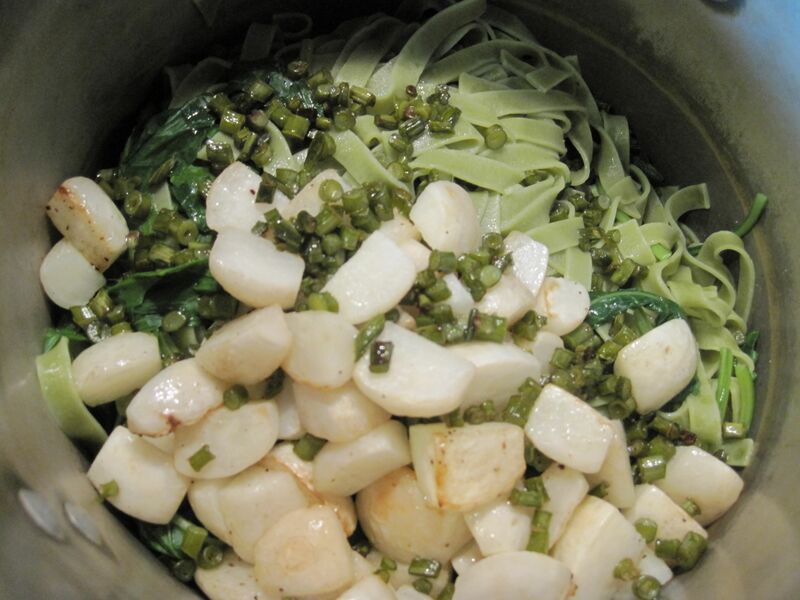 Gently toss together pasta, greens, reserved cooking water, turnips, scapes and oil. Serve with pecorino romano on top. 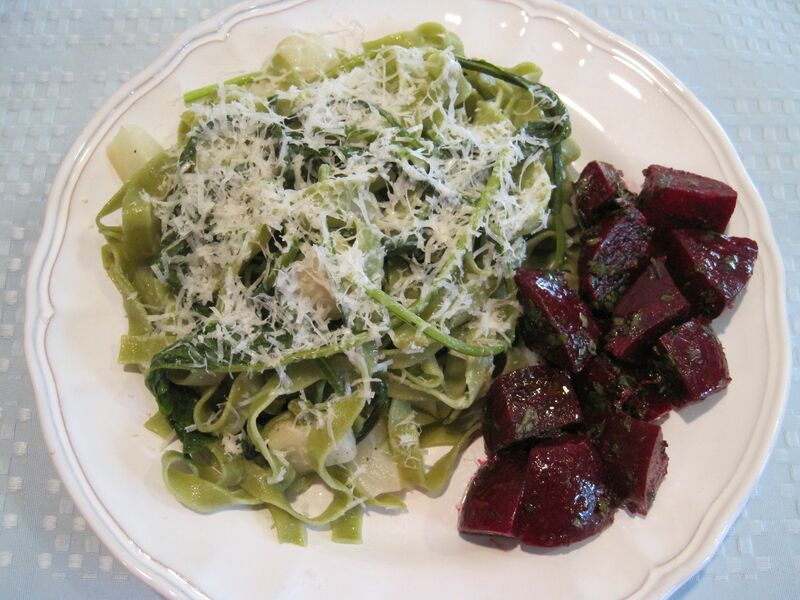 This entry was posted in Pasta, Vegetable sides, Vegetarian and tagged beets, Pasta, turnip greens, turnips by Jennifer @ Meal Planning Moms. Bookmark the permalink.